The Sons’ are at it again, bringing the masses another recipe they’ve knocked out of the park. 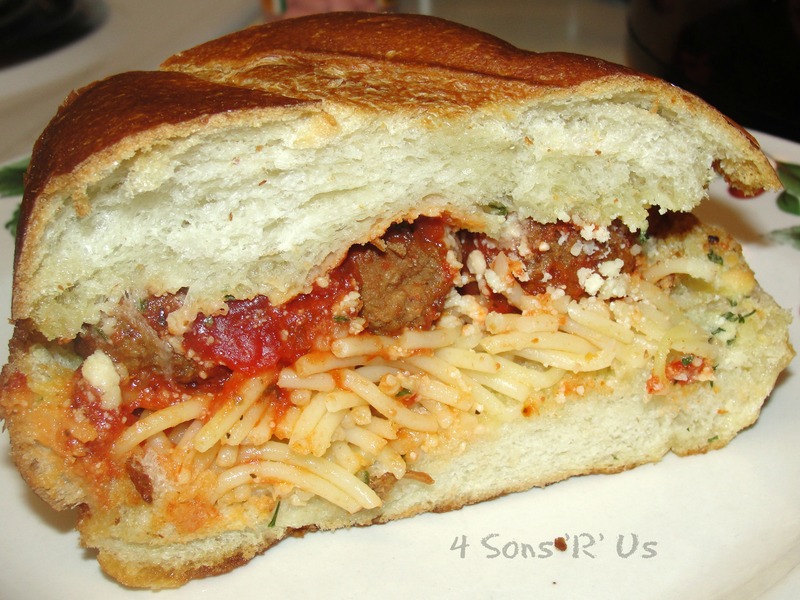 Garlic Bread meets Spaghetti and Meatballs meets the Meatball Sub and the result is out of this world! This recipe will leave your house smelling like a heavenly Italian restaurant and you’ll be lucky if you can keep your family from devouring it before it makes it to their plates. I think the Sons were worse than our pug that night, loitering around the kitchen and watching for any missed speck of this recipe while they waited for me to plate everything up for them. 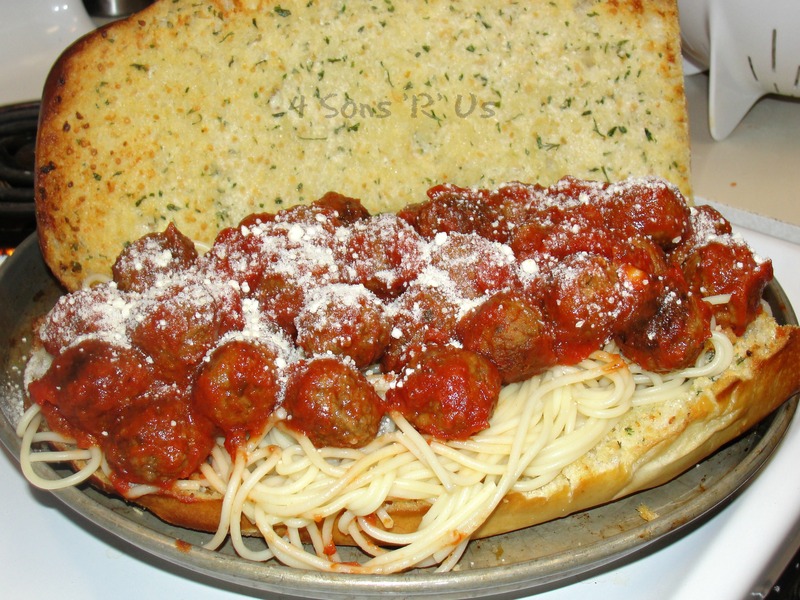 Savory, buttery, crispy garlic bread stuffed with delicious spaghetti and meatballs… it’s a match made in heaven. How could I blame the little scroungers?! He could easily (and quite happily) eat spaghetti and meatballs every night of the week. Which is why he nominated himself to oversee this particular meal. It may not be the prettiest presentation, but it delivers 100 % on flavor. All the sons and the hubs gave it two thumbs up. Just make sure you have some napkins handy, because it is messy. 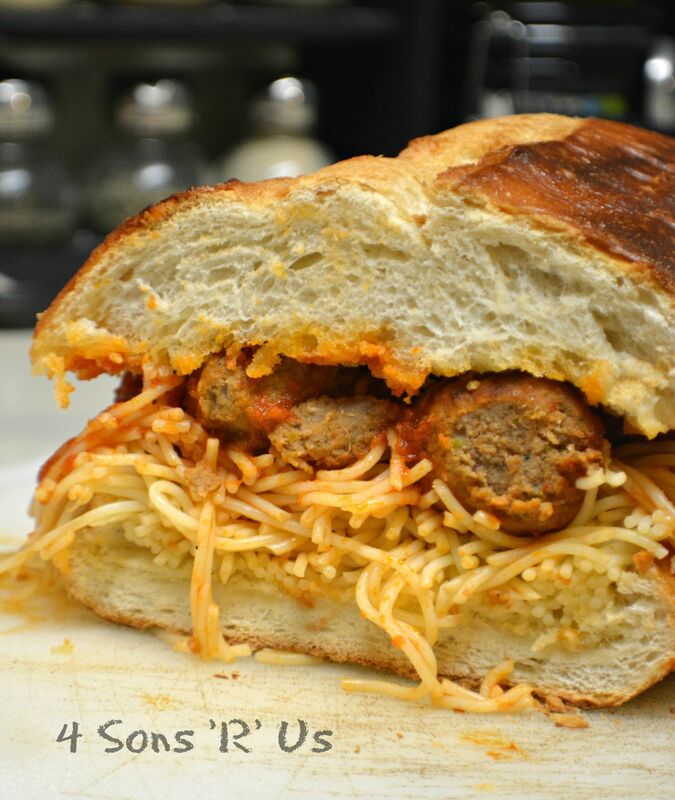 But man, you can’t go wrong with Garlic Bread meets Spaghetti and Meatballs meets the Meatball Sub! Enjoy! 1. Cook spaghetti according to package directions. 2. Cook meatballs according to package directions. 3. In a mixing bowl, combine the meatballs with the spaghetti sauce until evenly coated. Add salt and pepper, to taste, and then set the aside. 4. Preheat your oven to 350 degrees. 5. Cut your bread loaf in half length wise, and liberally coat both sides of the inside with garlic butter. 6. Place bread in a baking dish, or on a baking sheet, with the insides facing up and bake it until the butter is melted and inside is lightly crisped. 7. Once the bread has baked, top the bottom half with the cooked spaghetti, top the spaghetti with the meatball and sauce mixture, and then sprinkle some parmesan, and/or mozzarella cheese on top. 8. Put the loaf back in the oven until the cheese is nice and melty and the sauce is heated through. Slice loaf into individual sandwiches and serve with salad for dinner. UPDATE: The Sons’ found this gem and declared it a must share. 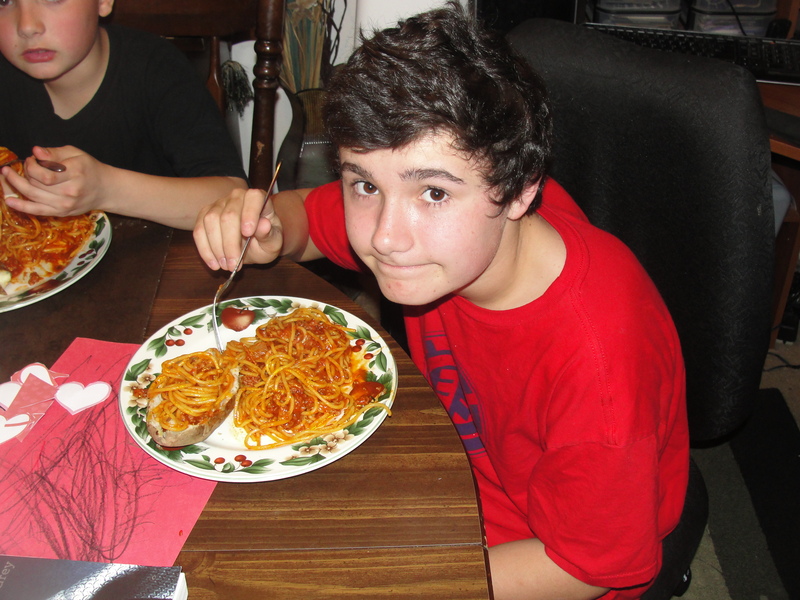 Son # 1 putting his spaghetti on a baked potato! Bleck!! Oh, it is! Just not something we’ll have too often (much to the sons’ disappointment). 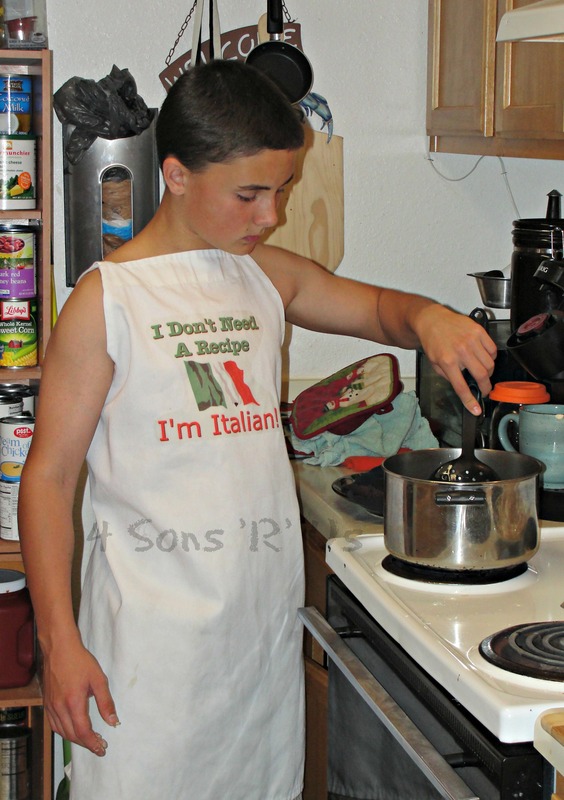 One of my biggest goals as a mother was to make sure that my children could cook and take care off themselves. Yours are well on their way too! It looks like proper comfort food! Yum!